Charles M. “Mel” Gray is a professor of economics at the University of St. Thomas, where he has taught economics and strategy to graduate and undergraduate students for more than 35 years. He designed the economics components of the full-time, evening, and executive UST MBA programs and regularly conducts management training seminars on behalf of the Management Center and the Center for Nonprofit Management. 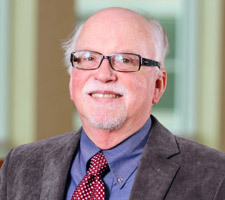 Gray previously served as a research economist at the Federal Reserve Banks of St. Louis and Minneapolis and for a Minnesota state agency, and as director of a Minneapolis community development corporation. His consulting clients have included MA Mortenson, 3M, Jostens, McGraw-Hill, the National Endowment for the Arts, the U.S. Department of Justice, over 30 local law firms and others. Gray has taught at Macalester College, Central Michigan University, the Universities of Minnesota, North Carolina, British Columbia, and Oslo, and the University of Rochester’s Simon School of Business and Eastman School of Music. He is coauthor of The Economics of Art and Culture (2nd ed., 2001), editor and author of The Costs of Crime (1979) and author of Turning On and Tuning In: Media Participation in the Arts (1995), in addition to his numerous articles, book chapters and cases. Dawn Bentley is the Executive Director of Minnesota Fringe; an annual 11-day theater festival presenting more than 1000 artists in over 800 performances of 165 works on a dozen stages. Dawn joined Fringe in April 2017 with leadership expertise. She is focused on navigating strategic vision. In her previous position as the first Executive Director of Art Shanty Projects, she was charged with creating infrastructure and establishing improved outcomes in all key functional areas. Ms. Bentley teaches Nonprofit Financial Management for the Arts in the Arts & Culture Leadership Master’s Program. Dawn is an art aficionado and has played the violin for over 30 years in various ensembles from rock bands to professional orchestras with a dozen recordings in her repertoire. She holds Masters degrees in Nonprofit Management and Business Administration from Hamline University in St. Paul, MN. Tom Borrup, Ph.D. serves as Director of Graduate Studies for the University of Minnesota’s Masters in Arts and Cultural Leadership and teaches Cultural Planning for Drexel University. Through his consulting practice known as Creative Community Builders, he consults with cities, foundations, and nonprofits integrating arts, economic development, urban planning and design, civic engagement, and public space animation. 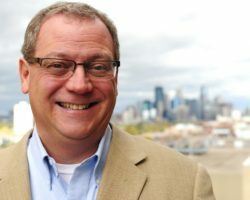 Tom is the principal and consultant with Creative Community Builders in Minneapolis and works with cities, foundations, and nonprofits across the U.S. on leveraging cultural and creative assets for community revitalization and change. He served as executive director of Intermedia Arts from 1980 to 2002. He received his Ph.D. from the Leadership and Change program at Antioch University; his research and dissertation addressed the role of organizational and social networks in the planning and ongoing management of cultural districts. In addition to his work at the University of Minnesota, Tom also teaches as an adjunct instructor for several university programs in urban planning and in arts and cultural management. Founded in 1885, the University of St. Thomas is a Catholic university based in the Twin Cities of St. Paul and Minneapolis. The largest private university in Minnesota, St. Thomas offers bachelor’s degrees in over 85 major fields of study and more than 45 graduate degree programs including master’s, education specialist, juris doctor and doctorates. The University of St. Thomas, a Catholic comprehensive urban university, is known nationally for academic excellence that prepares students for the complexities of the contemporary world. Through disciplinary and interdisciplinary inquiry and deep intercultural understanding, we inspire students to lead, work and serve with the skill and empathy vital to creating a better world. 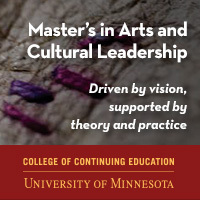 The Masters of Professional Studies in Arts and Cultural Leadership (ACL) at the University of Minnesota is designed to help students advance their skills as a leader in the field – not only as a visionary but as a collaborator and facilitator in the wider creative communities. Student experiences in the program are enriched by the internationally known thriving arts, cultural, and philanthropic communities of Minneapolis and Saint Paul.